What do you consider the perfect cat bed? 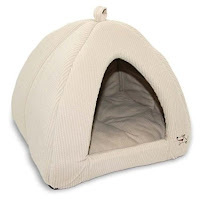 I want to get my cat a new bed, but there are so many choices, I can't decide. For me, the perfect cat bed is the one that looks like a little cave. I have other beds, but that's my favorite because I can curl up all the way in the back and no one even knows I'm there. It has a soft cushion, too, but it's not so soft I get swallowed up in fluff. Cat beds can be tricky. They have to be just the right size and shape. And, believe it or not, they can't be too soft. If the bed is too soft, we could get stuck in all that padding and not be able to get away quickly if we had to. Here are some thoughts on creating the perfect cat bed. Most of us love "doughnut" beds because they're round, and we like to sleep curled up. Our Honey Cat's favorite has high sides so she can hide in it, and no one disturbs her while she's sleeping. Belle's perfect cat bed has low sides. She likes it because she can stretch out if she wants to. Sizzle has a dog bed because he's so huge. But most of us prefer sleeping in small spaces. Put the bed on a chair, table, shelf or anywhere except the floor. We like to be up high where we're safe and can see what's going on. If you get one of those cave beds with a toy attached to the top, take the toy off. A fake mouse dangling in your cat's face will annoy her. And we take sleeping very seriously and don't play in bed! To let your cat know the new bed is for her, sprinkle some catnip in it or put a few treats inside. She'll like that. Don't be disappointed if she doesn't use it at first. It takes us a while to investigate new things and get used to them. When I got my cave bed, I didn't sleep in it for weeks! I love it now. 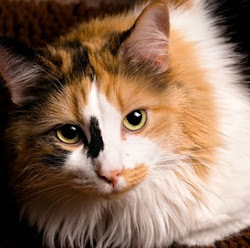 Something else that could keep your cat from using the bed right away is the smell. If it smells like the store where you bought it, she won't feel comfortable in it. You can solve that problem by putting an unwashed towel in the bed. Don't forget to sprinkle some catnip on the towel! Speaking of washing, when the bed gets dirty, wash it in plain water with no soap. If it smells like detergent, your cat might decide she hates it. Color is important, too. The colors we like and see best are in the purple, blue, green and yellow ranges. Sometimes the perfect cat bed isn't actually a bed. Katie and Muffitt love to sleep in baskets on our human's dresser under a sunny window . And Boccelli's favorite "bed" is a box from Amazon.com. We've gotten other boxes from Amazon since that one arrived, but it's still his favorite. 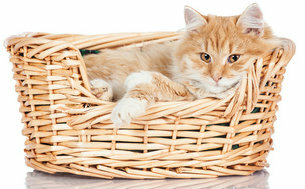 If your cat chooses a basket or box as her favorite bed, she'll love having a soft cushion (the kind that come in some cat carriers) or a couple of towels inside to make it even cozier. Actually, it would be really nice if she could have a couple of beds so she could choose where to sleep, depending on her mood. I know that sounds like an extravagance, but she's worth it! This looks like my tent cat bed.